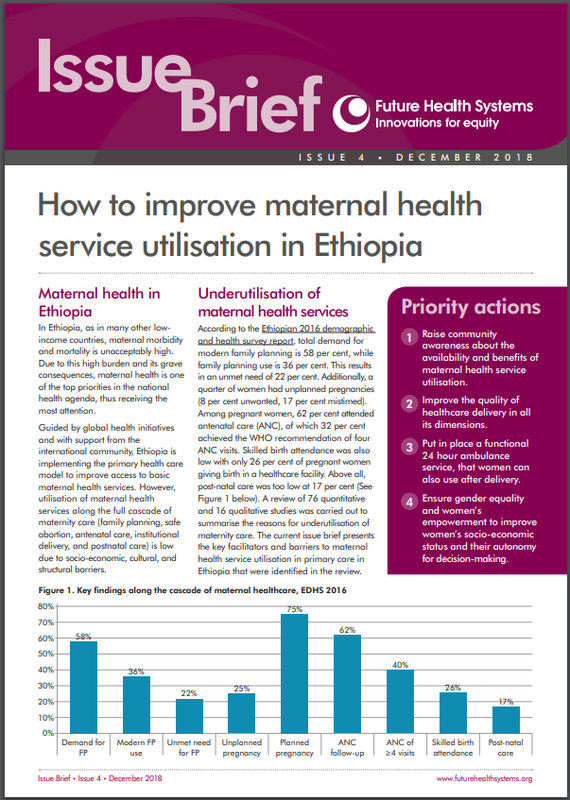 Guided by global health initiatives and with support from the international community, Ethiopia is implementing the primary health care model to improve access to basic maternal health services. However, utilisation of maternal health services along the full cascade of maternity care (family planning, safe abortion, antenatal care, institutional delivery, and postnatal care) is low due to socio-economic, cultural, and structural barriers. Raise community awareness about the availability and benefits of aternal health service utilisation. Improve the quality of healthcare delivery in all its dimensions. Put in place a functional 24 hour ambulance service, that women can also use after delivery. Ensure gender equality and women’s empowerment to improve women’s socio-economic status and their autonomy for decision-making.